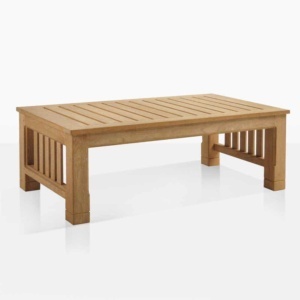 Dignified, sturdy and elegant; our Raffles Teak Outdoor Furniture Collection is named after the famous Singaporean hotel and inspired by the Mission style of the early 19th Century in San Francisco, where people craved traditional and trusted craftsmanship with an emphasis on a clean, polished design. 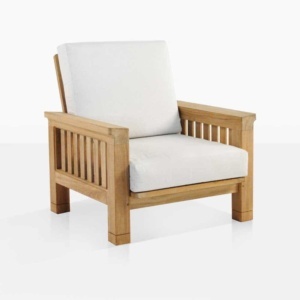 Emphasizing simple vertical and horizontal lines, the Raffles Teak Outdoor Furniture Collection features a subtle carved groove in the substantial, solid legs; with sleek paneling that accentuates the beauty of the Grade-A Teak. 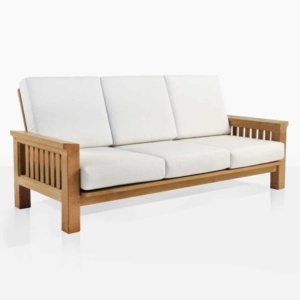 Design Warehouse’s popular Raffles Teak Outdoor Furniture Set will help bring to life any space with its stunning variety of different pieces! The collection includes a: 3-seater Sofa, 2-seater Loveseat, Club Chair, Ottoman, Coffee Table, and End Table. Wanting a formal setting? Place the Raffles Sofa in the centre of your designated space and a Raffles Club Chair either side for an inviting area to spin a yarn for hours. If you wish to wine and dine till the sun goes down; the Raffles Coffee Table will look perfect in the middle of this set. Like to put your feet up after a long days work? A Raffles Ottoman up against your Sofa, Loveseat or Club Chair will give you the comfort you desire and complete an already inviting, welcoming design. 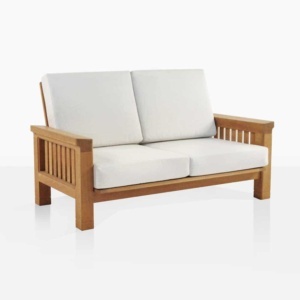 Made of the finest Grade-A Teak, and complemented with quality-assured Sunbrella® cushions; the Raffles Teak Outdoor Furniture Collection will be the go-to for hosting, relaxation and style for years to come! Comes with FREE Sunbrella® cushions with Quick Dry foam in a choice of two elegant colours: Taupe and Canvas. Colour Shown is Canvas.